We all know the story of Snow White and her evil stepmother where the mirror featured prominently in the tale but this important piece can actually be used as a beautiful design element in your home. There are lots of ways for a mirror to be used to complete the look in your home and we’re here to show you how. Any bathroom needs mirrors to ensure that your daily ablutions are done right and these beautiful suspended mirrors are great. These are great as both sides can be used so no one will be fighting over who gets to use the mirror. 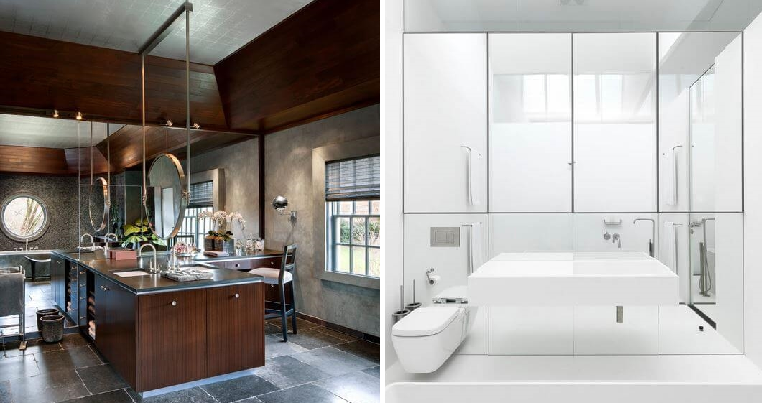 In a bathroom, mirrors can be big or small depending on your preference but for this one, it looks amazing as the mirror becomes the focal point of the room. It brightens up the space and makes it look more spacious as the big mirror emphasises the area with the glass mosaic iridescent tile lending a helping hand. Add a wall of mirrors to make the home look more interesting and make a statement as a type of wall art. The mirrors reflect the light to make beautiful patterns and makes it look more dynamic as well. Play around with the natural light in your bathroom by installing a cool mirrored wall inside which not only makes it look brighter but also more roomy as well. Best of all, you don’t even have to install a full-length mirror with this mirrored wall. Since mirrors are reflective and looks super bling, it can be used to dress up a room. A great example is this walk-in closet that has pretty mirrors to make it look stylish without going overboard. Your kitchen will always need a backsplash and that’s why you should use mirrored tiles to do so as it adds visual interest to the room. It’s fuss-free because it’s easy to clean and best of all, there are no ugly grout lines either.